What is a Featured Listings Widget? Have Questions? Ask Ballen Brands! A featured listings widget can be used to showcase your listings. You can place this IDX Broker widget on your website anywhere that allows the widget code needed. While logged in to your IDX Broker dashboard, go to Designs, Widgets, and Create. Under Build a Widget, select the Showcase option. Under Properties to Feature, choose featured properties from the list. Add a descriptive title under Widget Name. Choose the Sorting Order you prefer. Typically, you will not need to adjust the Width. The # of Rows if not an available setting for this widget. We recommend three for the #of Columns. For # of Listings, you’ll want to choose a number that works for space. We recommend six for the main page and fifteen for a regular website page. Choose yes for Display View All Results Link. This allows the user to see all your properties when they make that selection. To finish, click the blue Build Widget button. A Widget Code will be displayed in a box. You can copy and paste this code to your real estate agent website. There are also buttons for Preview Widget, Back to Widgets List, and Create Another Widget to help with navigating. 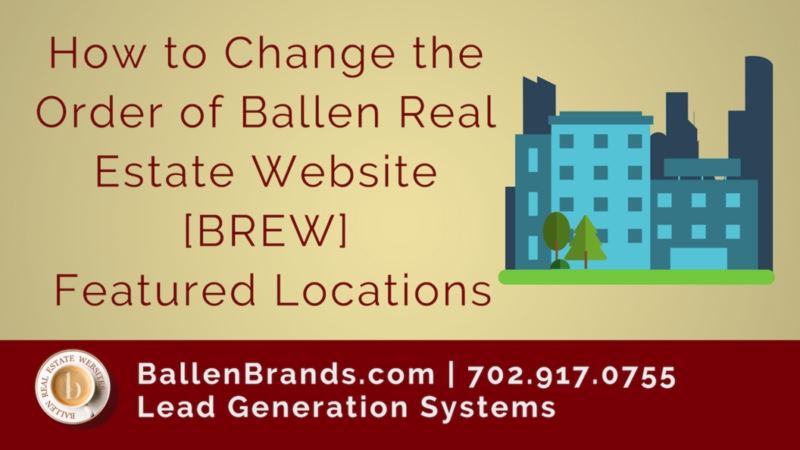 Contact us at Ballen Brands if have a question about a BREW (Ballen Real Estate Website), IDX Broker, or Listings to Leads. Give us a call at 702-917-0755 or email us at team@ballenbrands.com.